The concert captured here was a very special event. 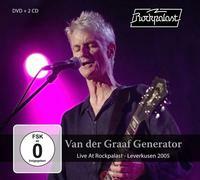 It was the reunion of Van der Graaf Generator. It's also a killer concert on its own. It's obvious that the reunion had lit a real fire under the group. They put in an exceptional performance. The video and sound quality this are definitely worth of the importance of the event. I love the fact that not only do you get the DVD but this set includes a two CD set of the concert. I suppose you could argue about the fact that there aren't any other bonus features (other than a trailer), but when it's this good, that seems like a petty argument, anyway. If you've ever been a fan of this band, you really need to pick this one up right away.